In 1994, for the first time in nearly a decade, Kenner began revisiting the Star Wars license. �The first products they released where small die cast figures sold individually and in packs of four or six. The line was unpopular and died rather quickly. 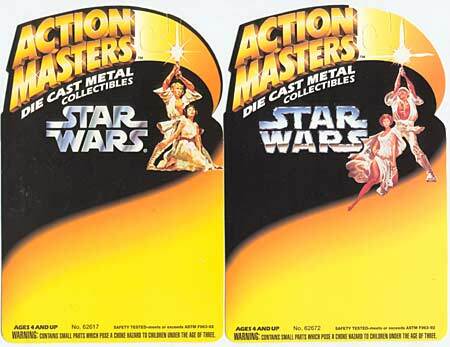 �The proof on the left shows an early packaging design which incorporates the vintage Star Wars logo and Luke and Leia painting that was featured on the first Kenner Star Wars toys from 1977-79, providing an interesting link to two eras in Kenner Star Wars history. This design was used in a bilingual version that was released in Canada, shown here. The back features a different layout and some paint scheme differences on the figures themselves (note the incorrect green saber for Luke). �Like the Canadian released cardback, this also does not include any text for the "Gold"�C3PO�offer, which would be on all produced packages released in the U.S.